And have a bond that is imperishable. You will not fear for I am steadfast. Can you tell who I am?... Friendship! but a life without good friends is no longer life. How are you doing? I am doing o.k. I know it is not very easy for you right now, but endure. Our Father has a great plan for us. Are you alone right now? Are you in a foster family or an orphanage? I just want to let you know that I appreciate you for enduring. We were always good friends and we always liked each other. Now it is very different — through the use of the Jugendamt we don’t see each other anymore. I wish we could just live together. We need to endure. I love you sooooooooooooooooo much! I miss you very, very much. P.S. I try everything so that I could visit you. to return to her family in the Community. May our Father keep and bless them! Eva and Besorah, two youth of the early christian community “Twelve Tribes”, protested during the traditional Stabenfest parade in the Bavarian Noerdlingen. They criticize the controversial action of the German authorities against the community. MUNICH, 22.05.2015 (FOREF) – Altogether 40 children of the Christian religious community Twelve Tribes were separated from their parents in September 2013 and put into state custody (see FOREF- report from 01.01.2015). This action was justified by a temporary order of the local court of Noerdlingen, and carried out by a police raid. The Higher Regional Court (OLG) Munich recently criticized the family court about the unusual length of the procedures. Until now only 22 children were allowed to return to their parents. Most of them were old enough to run away from their isolation. Eva, a youth member of the Twelve Tribes, was one of the 40 children and youth, that were separated from their parents during the police raid and brought to juvenile shelters (Jugendheim). Sabine Riede, a so called cult expert from the FERCIS affiliated Cult Info NRW, urged for this order, since she suspected systematic child abuse in the community. No evidence for abuse in the Twelve Tribes has been brought yet. After half a year Eva fled from the strict isolation and prison like control of the juvenile shelter and returned back home. Her younger sister however still finds herself in state custody. My little sister was torn out of our family”, said Eva. “There’s no evidence for abuse. Our parents always loved my little sister very much. (…) She was and is truly a treasure. We want to have her with us again. We will take good care of her. That’s why I fight for her”, the youth explains determinedly. 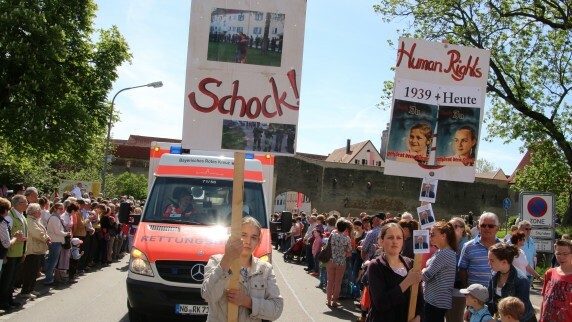 Together with Besorah, her sister of faith, Eva protested at the traditional Stabenfest in Nördlingen on Monday, the 11.Mai 2015, with signs and fliers against the stigmatization of their community. The fliers, that they distributed, had the title: “What the director of the district court, Mr. Beyschlag, failed to tell you”. Helmut Beyschlag, who is also the press spokesman of the court, wants to initiate an examination concerning a possible violation of the right of assembly, in reaction to the spontaneous demo. Beyschlag does not want to comment the ongoing proceedings concerning the custody of the affected parents. Chassidah, another seized child who ran away from the juvenile shelter, also turns to the public now, since she wants to point out the improper procedure of the authorities. She has not been abused by her parents in her life, but she feels put under massive psychological pressure by the Jugendamt since she was separated forcefully from her parents. There are still police raids irregularly on the estate “Klosterzimmern” of the Twelve Tribes in Germany. Since she escaped the institution Chassidah lives in “constant fear”, that the Jugendamt wants to separate her from her parents again. By now the irregularities of the court proceedings in the case of the Twelve Tribes even attracted the attention of the OLG Munich. In the most recent decree of the OLG from 20.04.2015 it was pointed out that since the separation has been going on for almost two years, the collection of evidence has not taken place yet. This had been decided by the district court in September 2013 already. The OLG reminds the district court about the importance of a speedy trial in family cases, for through the almost perennial process duration a “return to the child to the parents is would be complicated more and more” and the possible consequences for the psychological development of the children are to be considered. Besides that, the proceeding of the district court in Nördlingen seems to be problematic from the point of view of art. 6 (worthiness of protection of marriage and family, parental rights of upbringing) and art. 20, par.3 (the obligation of jurisdiction to statute and law) of the constitution for the republic Germany. The ruling of the OLG realized, that the repeated and explicit desire of the children, to live with their parents, makes the “temporary court order” from September 2013 increasingly questionable. In a press release from May 19, lawyer Michael Langhans, who represents eleven families of the community before court, explains that the responsible family court Nördlingen ordered psychological evaluations not until one and a half years after (!) the violent separation of the children from their parents. However most of the evaluations are not available yet. Apart from the long process duration of the present case the medical examinations already at the time of the first police raid provided no evidence of abuse of the children of the early christian religious community. The children should have been sent home on that very same day. In the meantime two children of the community can live again with their parents, who live in Spain. The concerned family briefly lived with the Twelve Tribes in Wörnitz as guests in September 2013. This decision was consensually decided from the parents, the Jugendamt, and the lawyer Langhans in a hearing before the OLG Nürnberg. Thus the first appeal at the OLG was negotiated successfully for the Twelve Tribes. Lawyer Langhans is confident, that within the next months more rulings in the proceedings about the custody battle can be expected. Two of those who belong to him are Nechonah, the daughter of Sharat and Sh’mariyah, and Schifchat-Jah, the daughter of Shua. They have experienced, against all the power of German society, this very turning. They are thankful. Here are their words, and the words of their parents. Truly, like Abraham and his seed, they have become “daughters of the commandment” (bat mitzvah). that his mother would catch him. and He returned me again. Thank you for being my wonderful examples. taking on your heart and running with it. I want to honor you. I’m very thankful for my precious daughter Nechonah. She is a very courageous girl, overcoming whatever separates her from our Father’s life. She ran away two times out of state custody. She also waited patiently for the day of her Bat Mitzvah. Before the raid I had already started to prepare her, but even after she returned it still took more than a year until her heart could be confirmed in a covenant with our Master. She went through many tests in this time, but she always trusted, patiently waiting for the right time. Our Father honored the courageous stand she took with salvation. Shall He not much more deliver her from the hand of the German government?! We continue to trust. I am very thankful I could make a covenant with our Master and with you all at my Bat Mitzvah. I am one of the children who escaped the orphanage and I am still on the run. Still our Father saw my heart and prepared a way for me to become a true Bat Mitzvah, together with my friends Nechonah and Hannah, daughter of Kepha. Since Nechonah and I were out in the world for half a year, we were also used to the culture of the world which is, especially, disrespectful to parents. I am thankful for the people who, before the Bat Mitzvah, saw what we struggled with and helped us to see it. I was very thankful that our Father was merciful and that we could change and be different when we saw it, but still I knew that I could only truly overcome it by our Master’s grace. I am thankful that the Holy Spirit will help me to overcome my iniquities. I am also thankful for my friend Besorah, Abijah’s daughter who taught me that the Bat Mitzvah will only be a ritual if there is anything in my heart that I didn’t confess. I am so thankful for the wonderful heart of my daughter, who – no matter what we went through the past 1 1⁄2 years – never wavered in her steadfast desire to be “where my family and my home” is. Once at home, life has never been the same. We have seen the deliverance of our Father, His sovereign protection – He has hid her in His palm, not allowing one hair to be touched. It is such a miracle. “Love is our home,” has come true in so many ways, as we met His love in His people in various places and it’s because of this love that we found that healing and rest also to our souls. Even to the point where Schifchat-Jah’s heart would not only turn to her parents, but also to our Master in a greater way. I know it wasn’t mystical for Schifchat-jah to meet the requirements of the gospel in her life to leave everything behind – her homeland, possessions, even her own family in order to obtain the pearl of great price. Nothing could stop her from expressing again and again: I want this life, the Twelve Tribes are my home, and I need Yahshua to save me from my iniquities. It is such a great and awesome miracle to me that our Abba could bring this about, greater than all I expected and I am so thankful for restoration and the sweet fellowship I can enjoy with my daughter again and again because we have forgiveness. I know we could have never reached this milestone without precious true friends who stood with us and who encouraged us step by step – it was our Father who led us all the way so far, from minchah to minchah (our daily gatherings together, morning and evening, to give thanks and praise to His name), and it gives me much hope that He will continue and finish what He began with all of us. I want to especially thank all our very special friends in other places for your love for us – you are all very dear to us and we are forever bonded to you in our hearts. Thank you all for your wisdom and great loving kindness – every single one of you; we love you so much… and so we press on to learn to run together, side by side… your friends forever in Yahshua. Children naturally and instinctively recognize such discipline as love. Our Father made them that way. Equally, they know the lack of discipline as hate. Rebellion is the natural response to such hatred. No law can undo the truth of human nature or alter the unchanging reality of the Word of God. in the “Augsburger Allgemeine” on May 12, 2015 in the article, “Conflict about The Twelve Tribes” you might have seen two posters held up by two girls in the parade. One poster showed a girl from 1939 with the title “You too belong to the Führer” and the other one was with a girl from today, and it said, “YOU TOO BELONG TO THE STATE”. I just wanted to let you know: I am this girl from today and I feel exactly like on that picture. The Jugendamt and the family court treat me as if I belong to the state. Since almost two years they try to control my life – without reason. On September 5,2013 they wrested me from my parents and the community in where I lived, with hundred police, and brought me to the District Office Donauwörth. There were police standing at every exit and in every corner. After a conversation with a social worker we were brought to an examination room. There we were examined medically by state doctors, even though we already let ourselves be examined voluntarily by state doctors in Klosterzimmern. We had to undress completely and of course they didn’t find or anything not even a scratch and I thought, we would go home right away since it was clear that we were not abused. But to my terror they transported me and one of my friends to an institution for difficult girls. There we were put into “youth protection”…one room with nothing inside besides two beds and a little bathroom and two locked windows. The educators could only air out the room while we were eating and during that time the door was locked behind us. Before we got back to our room they locked the windows again. A real PRISON! For the next five weeks we were completely isolated. I was not allowed to have any contact with my parents, my siblings, nor anybody else – with no friends or acquaintances, not even with my grandparents, who do not even live in the community. All my steps were controlled and watched precisely – we could not even take a walk to get fresh air. In that time I did not get to see my parents, that was very hard for me. Finally after weeks I could phone with them for ten minutes a week, but only under supervision. The phone call was listened to and the educator told me what I could say. Afterward she had to write everything down. Also all my letters were opened and controlled. My letters to Judge Roser at the court of Nördlingen and to the Judge Prexl at the Higher Regional Court were never answered. Even though I made it very clear at the hearings, that I want to go back to my parents, they only wrote in the rulings that I am endangered, because I live in the community and we believe in the Bible. I missed everything at home so much – my parents, my siblings, and our beautiful, peaceful life together. How we were together all the time, it didn’t matter what we did, we always had so much fun together. Instead I was here, locked up behind high monastery walls and I could do nothing of all what I used to do before. After half a year I had enough of it and finally fled from the institution. When I arrived in Klosterzimmern, I was so happy and I thought that now everything could be like before – but unfortunately it was not like that!! The Jugendamt still tries to control my life. Constantly they come with police raids to our property and try to catch me again and return me to the institution. Since my flight from the institution I have to live in fear all the time, that I would be brought back to where I don’t want to be. Yes, I think I have the right to say that the state controls me, for it is exactly like what I heard about the time 75 years ago. I thought, that people changed in the meantime. It is sad to see, how history repeats itself. It was clear to me, since the beginning, that the state wants to destroy our community. And that that state tries to do it through the children. It is like genocide.1 If you take away the children of a people, the people perishes. Last year the Jugendamt again did a raid with hundred police, to look for me and another girl, that fled from a foster family. The Judge from the family court Nördlingen said that they could enter every house and every room of the village, because it all belonged to the Twelve Tribes. It is, as if the police in Nördlingen can search every house in Nördlingen, just because I belong to the Catholic church and everyone in of Nördlingen is catholic. Can I live according to my conscience in Germany? Why can I not at least go with my parents to a place where I can do that? They told me clearly however, that I could not live like before and that they want to continue to control my steps. But is there reasons for that? — NO! There was none and there is no reason. I was never abused in my life by my parents. I feel abused by the Jugendamt and put under psychological stress. My school performance in the institution showed, that I was very well educated up to that point. Our common life and our culture was very appreciated by all thousands of people and all enjoyed it. Yet it is not a good life for me, according to the JA. it is not just a problem with your family, but also with the community and because YOU belong to it, we won’t let you go free. It’s important to know that I am with my God in purity and that I have lived for. It is what I have been created. The heart of our Creator you get to know by people—it’s not mystical. That’s why you need friends—people who give their heart to their Creator and His love. I can only pass on the love that has also been proven to me. For this I must have a clear conscience and know that I am pleasing to Him: how I am and what I do. This is reflected namely in my relationships. I want to share my life with others and let them know that God loves them and cares about them. To me it is important to be close friends with someone that you are on the same wavelength with, with whom you feel needed as a person, not only in the practical work, but also mentally, where you are in the exchange and can hear each other. I do not care what work I am doing, but the relationships that I tie up with it are important to me. But that would not be if we did not have the Son of God as a spiritual role model. I believe in Him, without Him, our lives would make no sense. He gives me hope that we can all be one and that we can be cleaned from the things that divide us. This process we experience every day. It is important to me that people feel loved – no matter where they are. This requires a lot of humility, because in order to be one, you have to doubt yourself. I mean, you must have the freedom to express yourself, but also be prepared to hear from others and esteem them for their own opinions. You must be able to hear the heart of man, what does he really mean? If I assume that he actually has the same heart as I do, then I can listen to him. It was her brother, Chayim, who spoke of “A Family Torn Apart” by the Jugendamt in the Raid. And it was her sister who wrote many moving letters to her parents and her judge, precociously wise in her words such as, “I have not been born for this place,” and “Everyone in Germany can choose his own religion and live it out? (Not me! )” Here is a picture of that precious girl and her equally precious friend, both of whom courageously fled the oppression of foster-care. Nechonah (riding, age 12) and Chassidah (walking, age 11)…after their escape from captivity. The story we tell is of one young man, just a small but significant part of his story. His parents are German, and he grew up much of his life in Germany, but he was born in America. Recently he spent some time with us where our communities began – Chattanooga, Tennessee. He was a youth taken in the September 5, 2013 police raid on Klosterzimmern.Why did he not come to love the world he was thrown into and hate the world he was ripped from? Perhaps, after all, force cannot turn love into hate. This must be such a disappointment to those who authorized the Raid on our Communities. Chayah Markeli returned to the Community, “voting with his feet” which place was best for him — German society or the Twelve Tribes of Israel — after he turned eighteen. Conflicted whether to come home or stay because of his desire to protect his little brother, Addar, from the abusive treatment he was receiving at the institution they were both at, it was no easy decision for him. Addar Markeli at the St. Nikolaus Improvement Center where he was held. Addar was freed on March 12, 2014. For the last few months, the clan of Chattanooga had the honor to serve shoulder to shoulder with Chayah, the son of Boaz and Shua Markeli. Like a well trained son, he served us relentlessly. Day and night he was always ready to serve. There was no job too small or great — from making our Yellow Deli cornbread to helping repair vehicles. From making smoothies by night to lawn care during the day, he was willing and eager to give all that he could. The children prepared a song, a throne was made, a delicious meal was prepared, a beautiful banner was painted, and best of all, hearts of love overflowed. The theme of our evening was honoring a valiant warrior. Like a wounded soldier returning from battle, Chayim stood among us faithful and true. Though he was afflicted he remembered the purpose for which he was born. His life was compared to an untold hero returning from the battlegrounds to tell his story. Although marked with battle scars, pain, and even at times a bit disoriented; still his heart filled with gratitude to fight and stand for a worthy cause. Much appreciation was bestowed upon him for his courage to stand. It was made clear to all that his stand was only possible because of the good things put in to him by his wonderful parents. Tsel, his older sister, spoke in tears about the day of the raid. For weeks no one heard anything about the children. All we could do was pray earnestly, even crying out to their God. Finally, after six long weeks, small communications began. Tsel spoke of her deep gratitude and love for her brother that he endured through this time and longed for a way of escape. It was very special for the Tribe of Benyamin (southern United States) to have both Tsel and Chayim together for a time. What honor they brought their parents! It was no coincidence that Chayim came to Chattanooga at this time in his life. He came right to the place where it all began. At this time in Chattanooga there is a small band of nucleus who lived in the original Vine House. They have stood the test of time, knowing the purpose for which they were called. These are those who bear the marks of the loss and pain of the battle, but still remain loyal. One that has been marching forth for years. Chayim stood to his feet that night, tears streaked his face as he responded in love. He looked around the room, his eyes fixed upon our faces, as he peered into our eyes. Filled with gratitude he gave thanks for the opportunity to come to the place where this life first began. He thanked us for our love, encouragement, and gentleness towards him. A bond had formed that has the strength to cross into eternity. He related that they rolled out the red carpet for him to have every opportunity to get set up with an apprenticeship and receive support from the government because of the way he was raised. But he chose to continue to further the life that his parents had entered into some 30 years ago. He told them that the only reason why they gave him all those opportunities was because of the way he was raised, because there were many other youth in that home who weren’t being given the same opportunity since they lacked such an upbringing. But who listens to our children who love the Community of Faith their parents raised them in? Like Chayim, we are thankful for the struggles we go through. Indeed, they are essential to enter the Kingdom of God!3 And like him, we press on. He is a hero to us, as are all our brothers and sisters there. This faith is what will cross over into eternity.